Baby’s 1st Birthday! Unicorn Birthday! Oh my gosh you guys our baby girl turns one today! 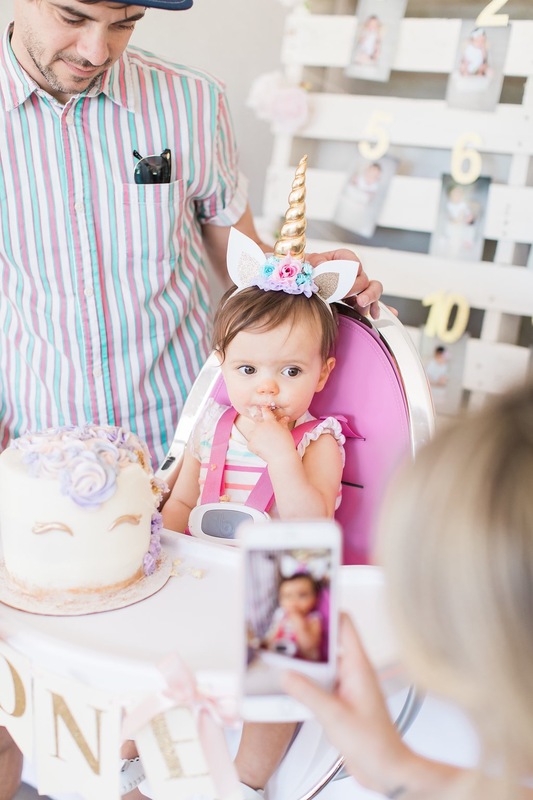 I’m so excited to share all the details form her unicorn birthday party! But first, I need to let out some tears! I’ve already been an emotional wreck today. I thought I was totally fine and then I got an email from a baby website I read with the title “Your one-year-old” and I lost it. I didn’t think I would be so emotional. Especially since we had her unicorn birthday party over the weekend and I was totally fine the whole time. OK maybe I choked up once looking at her 1 through 12 monthly photos. But for the most part, I held it together. It doesn’t look like today will be the same. Anyway get ready for tons of photos (Thank you for your amazing work Ashley Burns Photography!)! 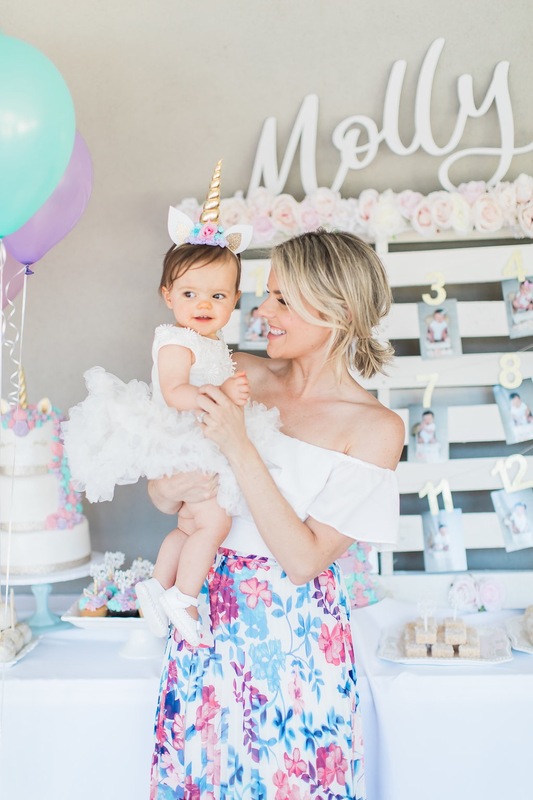 There were just so many cute moments from Molly’s party that I couldn’t narrow them down. Well, I actually narrowed them down a lot but I couldn’t narrow them down anymore so I’m posting tons of them! And of course sharing some details with all of you. Can we first talk about this dessert bar. How gorgeous are all these desserts. A company called Polkatots Cupcakes made the dessert bar and the cakes. This is my first time using this company, I decided to go with them because many of my friends had used them in the past and we were so impressed with her work! And she did not disappoint for Molly’s unicorn birthday party!!! 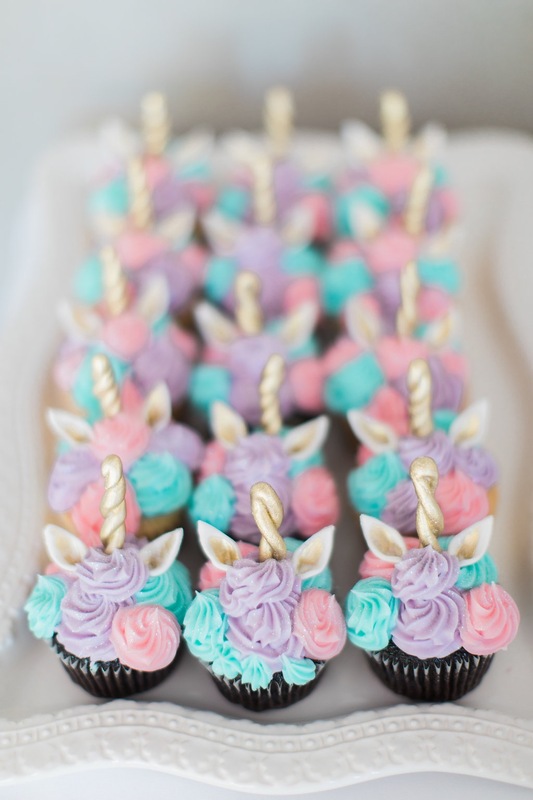 I mean just look at these unicorn cupcakes! They’re so whimsical and beautiful! Definitely Pinterest worthy! I will certainly be using Polkatots Cupcakes for many parties to come! I topped some of the desserts with little cupcake toppers that say Molly Turns One from POPPYjack Shop on Etsy. I’m so obsessed with Etsy and absolutely love how you can personalize so many things. I did some DIY for the party as well. This 1 through 12 month photo display was a super fun DIY project that me and my friend and photographer Ashley Burns (these are all her photos and she’s amazing!) made one weekend. We made it using a dusty old pallet that we sanded down and painted and sanded some more to look more worn. Then I bought these 1 through 12 hanging numbers with little paper clips on the back to attach all the photos. We glued some artificial flowers around the outside and I think it came out perfect. A focal piece of the 1 through 12 photo display is the big Molly sign on top! What I love about this sign is that it totally finished off our project and it’s now hanging in Molly’s room on the wall. So I was not only able to use it for the birthday party but now it’s a beautiful piece of art in Molly’s room! I got the sign HERE. My friend Ashley also brought the smash cake from Ginger and Fox Bakeshop for Molly. Such a nice gift and it’s so darling. It fit right in with all our other desserts! And you know I’m gonna give you details on Molly’s absolutely adorable outfit! Her dress is the cutest thing ever! We honestly don’t normally dress Molly in super girly things. Heck, she wore a white onesie to our wedding! 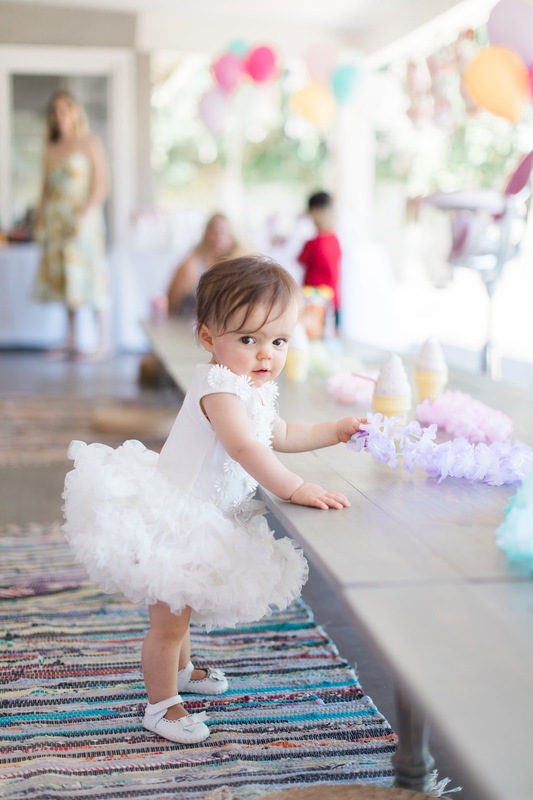 But a super girly, frilly dress just seemed appropriate for her unicorn themed first birthday party! And to tie in the unicorn theme we did this gorgeous unicorn headband. It just made all her photos extra cute! Finished off her girly little look with some white baby shoes that are just precious. Oh and my dress is a fave of mine! I’ve worn this dress and blogged about it before. It’s just so pretty! I wanted a cute prop to do photos with and this ONE sign by an Etsy shop called Little Sparrow Bows was perfect!!! (Again I’m Etsy OBESSED!) Everyone at the party was asking where I got it. In fact, I actually used these exact letters at my bridal shower. I had the letters to spell out LOVE. So since I already had the O and the E I just had to order the N to create ONE. So if any of you out there are wanting to do something like this for your babies first birthday party. My recommendation would be to get the letters to spell out love and then the extra N so you can keep the letters and display them in your little girls room. That’s what we’re doing! The LOVE sign would also be super cute for a wedding prop. All Molly’s little friends walked away with goodies too! 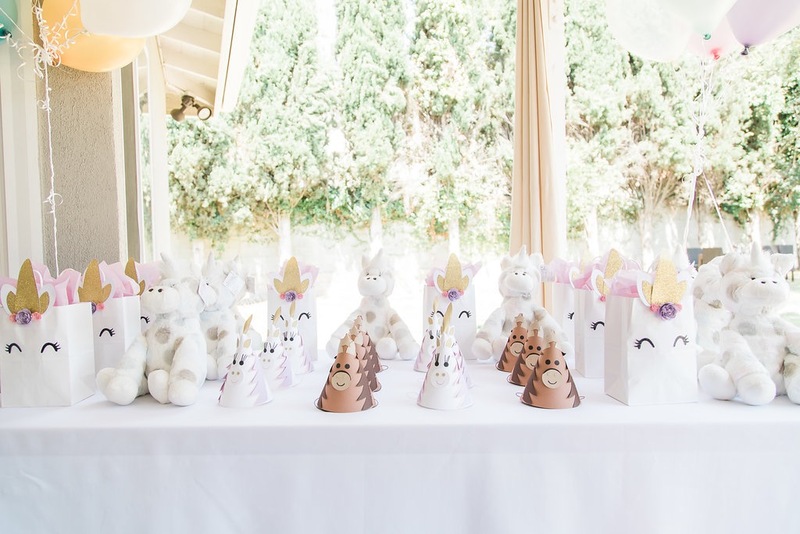 To tie in the unicorn birthday theme we gifted unicorn plush toys by Little Giraffe. They are the softest things ever! As soon as I saw that Little Giraffe had the unicorn plush stuffed animals, I knew I needed them as a gift for Molly’s party. The kiddos absolutely love them! We also wanted to give away something parents need for their kids and one of Molly’s favorite things is her Zoli straw cup. 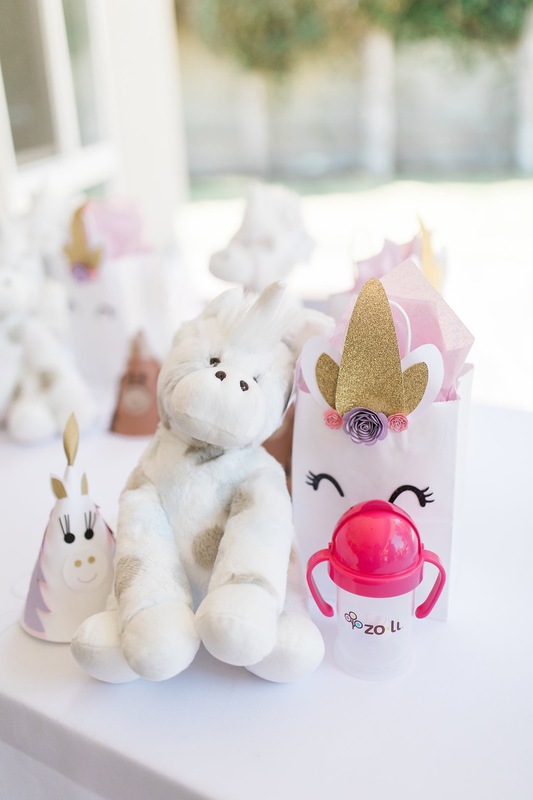 So every little one got a straw cup and I wrapped it up in the unicorn gift bag to tie in the unicorn birthday theme. Each kiddo also took home a little unicorn party hat or horse party hat. It was so fun to watch Molly dig into her smash cake! She was unsure of it at first but as soon as she got a taste she dug right in. 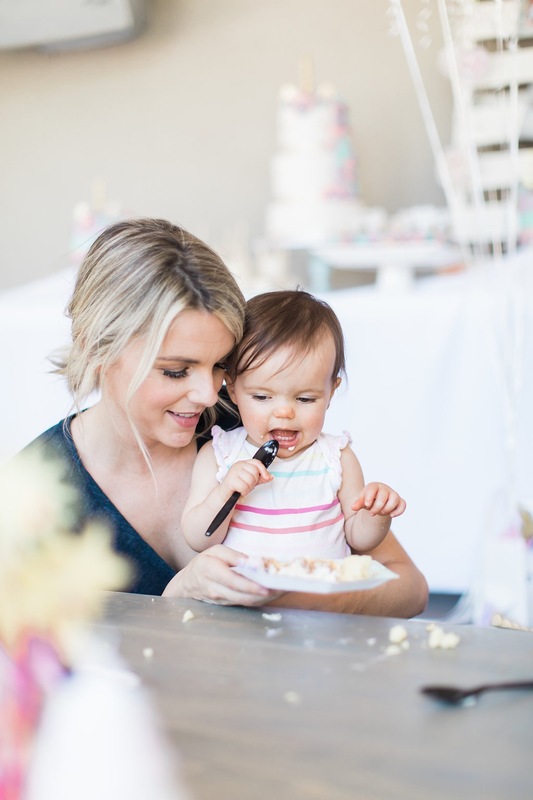 And then when we took her out of her highchair she was able to find another piece of cake on the table to share with her future cousin. It was the cutest thing ever! Now that she’s tasted sugar, she’ll seek it out anywhere! Ha! And a bunch of you asked me on Instagram where this highchair is from. It’s Fresco Chrome from Bloom. And this is the ONE highchair banner. And I have to give a huge thank you to my future sister-in-law’s family! They brought over all the low to the ground tables for the party. 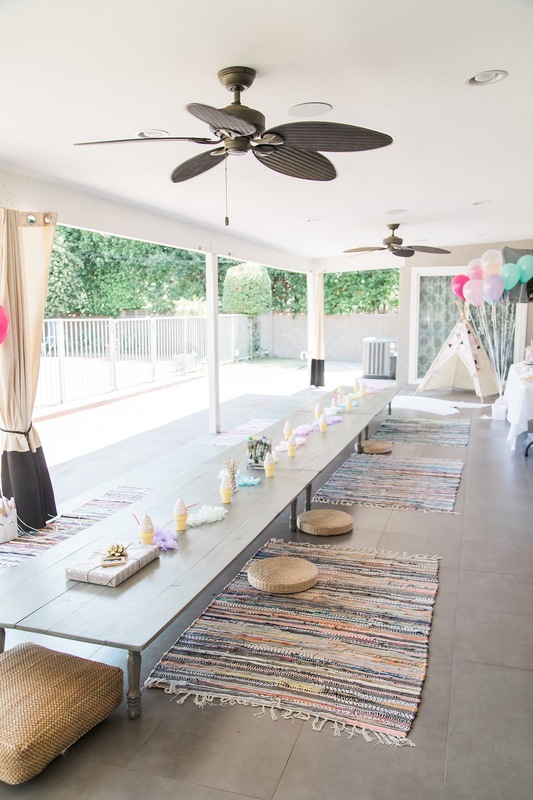 The tables are only a foot or so off the ground and they were so perfect for a first birthday party. That way parents could sit on the ground to eat with their kiddos. Oh and we ended up renting a house in the town next to ours so our family traveling in from out of town could all stay there with us. Also our house is really small and we don’t really have much of a yard so the extra space and outdoor entertaining space was absolutely necessary for the party! In the end the day was absolutely perfect! I honestly wouldn’t have changed a thing and I’m so grateful all our family and friends were able to get together to celebrate our special little girl! I can’t believe I’m now the mother to a toddler! How did this happen?! 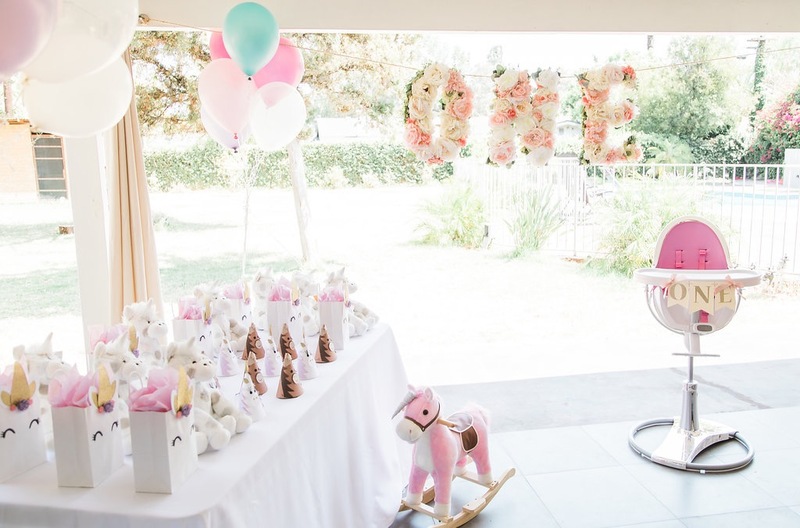 Hope you guys love all these photos form Molly’s unicorn birthday party! Thank you all so much for following Molly’s first year and my first year of motherhood! I hope you guys have enjoyed my blogs about parenting over this last year and what it’s been like to be a mother to an infant. Now get ready for all my toddler blog posts! I’m sure there is plenty to discuss! Luv you all! And Happy Birthday Molly!!!!! 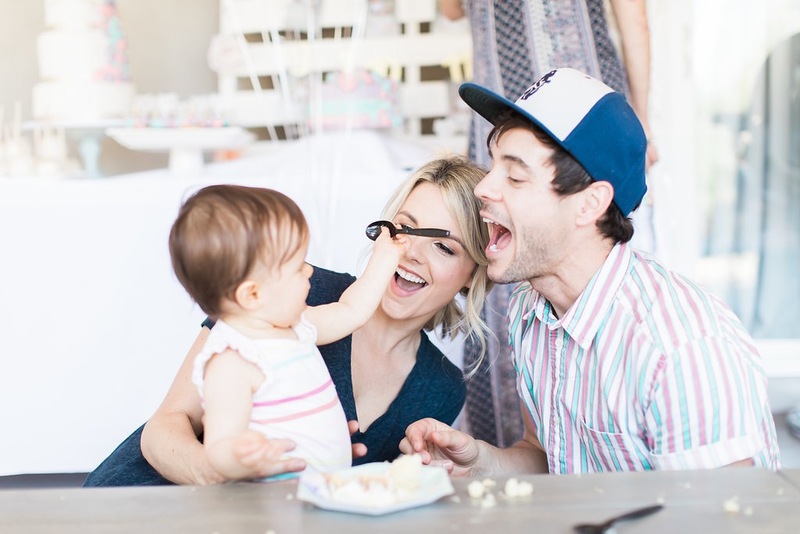 This is the cutest, best birthday party ever! I wish I had one like this when I was a kid – heck, I still wish I had one like this now! 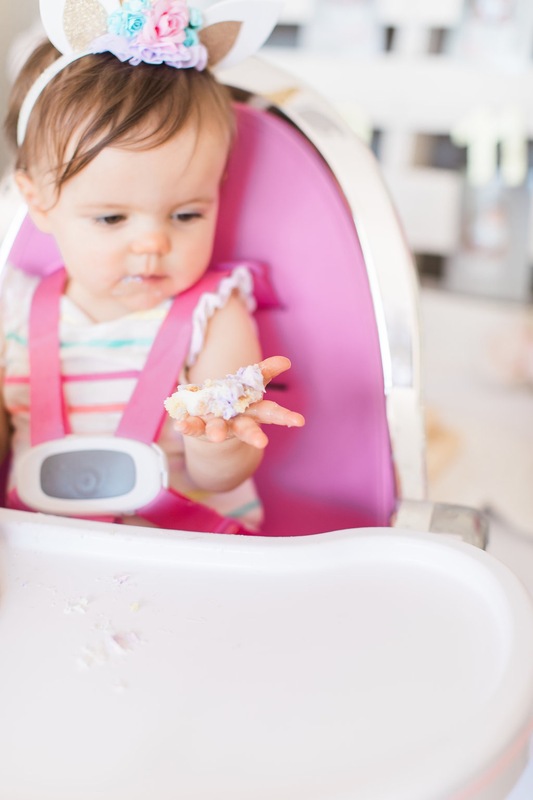 Ali—what highchair do you have in your kitchen? I wanted the one she uses at home, not for the party! Thank you though! She is precious! Happy 1st Birthday Molly! Love the theme, decorations and ALL of the pics! It definitely was a celebration for us too! Yes I agree! I felt like that with my daughter when she turned one. It definitely is a milestone for the parent as well! Hard work and many sleepless nights! Thanks for sharing such a special occasion. I loved reading your blog & looking at all the cute pictures. 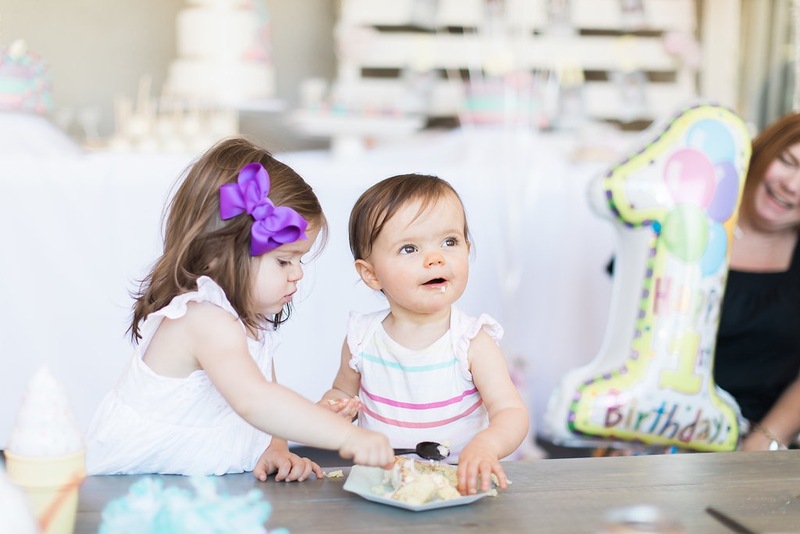 Ashley did a super job of capturing Molly’s precious personality & her 1st birthday party. The decorations & the DIY project were so impressive! Ali…what size did you wear in your dress. Wanted to order but wasn’t sure of size. Happy Birthday to your beautiful girl!! Absolutely adorable! I love all of the pics! 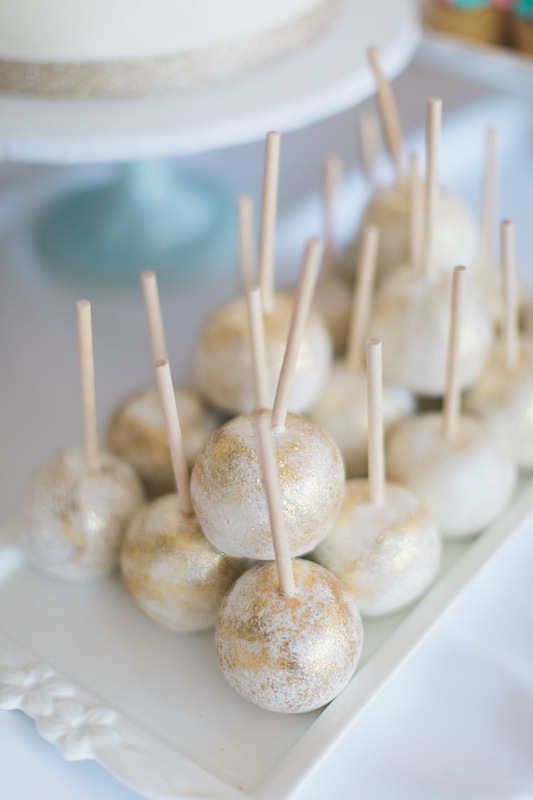 I, myself, am obsessed with all the little details and fun things that go along with a child’s birthday party! 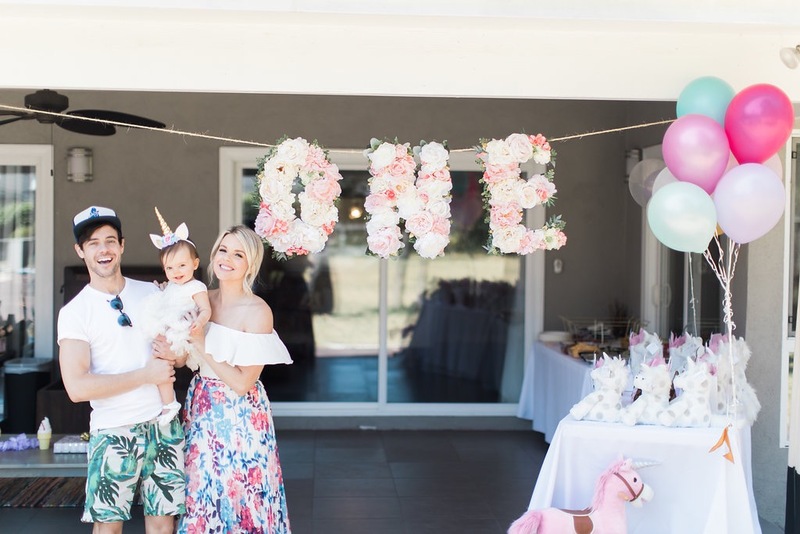 My daughter just turned one in May and I had such a blast DIYing a ton of things for her twinkle twinkle little star themed party. 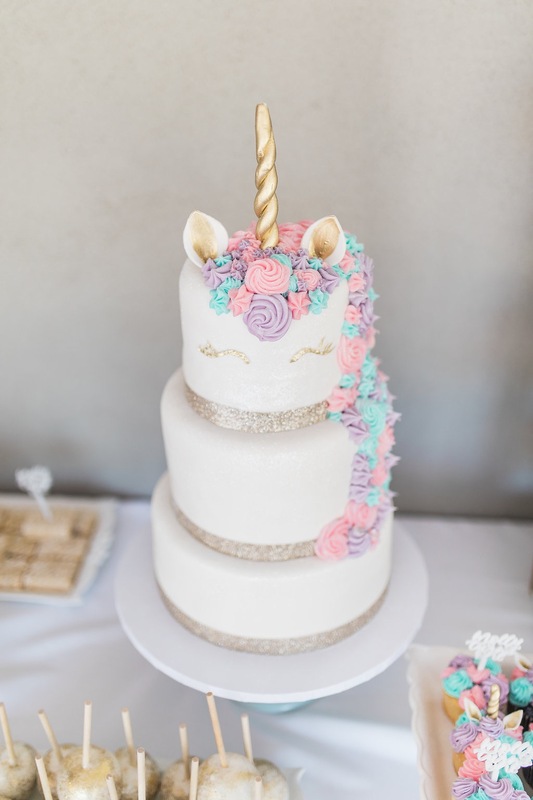 Love the unicorn theme! Happy 1 year! Oh my gosh Ali I don’t even know you but looking at these pictures and reading your post made ME cry too! My baby turned one last month, so the feelings are still raw I guess haha. Happy Birthday to Molly! She is precious. Happy Birthday to your little one too! Oh my gosh! This is so cute. I am 3 weeks away from my daughter’s first birthday party! I didn’t think I could get any more excited but this post just sent me over the edge! Thanks for sharing! Love it all!! So adorable 😊 I had so much fun planning my baby girls first birthday and soon will be planning her 2nd already! Get ready momma! They are busy busy busy but sooooo much fun! Happy 1st Birthday Molly!! Such a gorgeous party!! 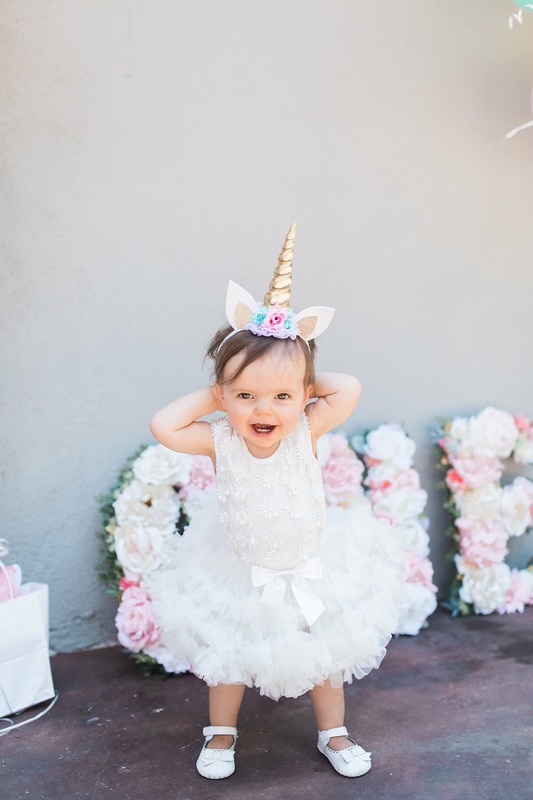 My daughter turns 1 on July 25 and her party is also going to be unicorn theme 🦄!! I’m already having so many emotions about her turning 1! I’m not ready for it! It feels like I just had her! She’s such a little person now. I love following all your posts about Molly and your family! Keep posting!! Thanks for sharing your life with the world!! This is the most precious and creative party Ali! I love the pictures with you holding her and just taking her all in. Such a precious moment and special memory from that day! 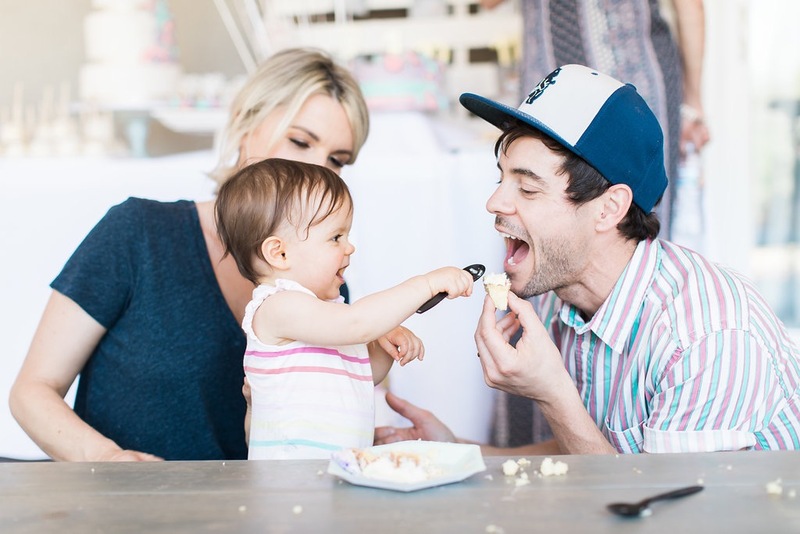 Thank you for letting us be a small part of your sweet family! And Happy Birthday Molly! Can’t wait to see her grow up more over the years and when you have a sibling for Molly! As I approach my daughters 1st bday (Aug 10th) I’m balling reading this… it’s so crazy where the year has gone!!! Loved ur theme, loved your details and loved all your photos! Happy 1st Birthday Molly!!! Absolutely adorable 🎀 Love your style & Miss Molly’s style! Love following your blog! 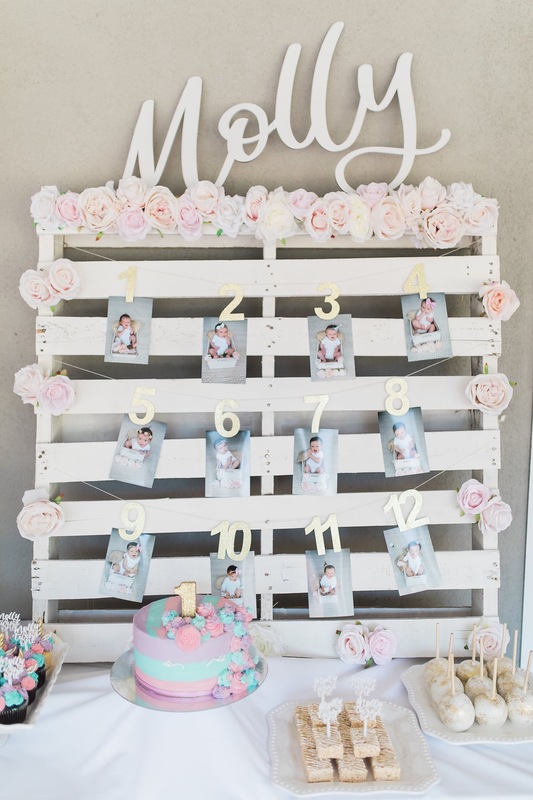 I’m totally copying some of your ideas for my baby girl’s first birthday next month 🙂 I already have a pallet for my photo board!! This is the cutest thing ever! And I love all the colors! And how your dress totally matches!! Happy Birthday Molly, I see you have had a wonderful day with all your family an friends, hope you have many more healthy ones, may god walk with you all the days of your life. Molly looks like she had a really good time at her first birthday party! Everything is beautiful and you look great! #UnicornEverything!!! 😍 Next party I have to get those low tables! 😍 And beautiful images… Ashley did a great job! love it all!! 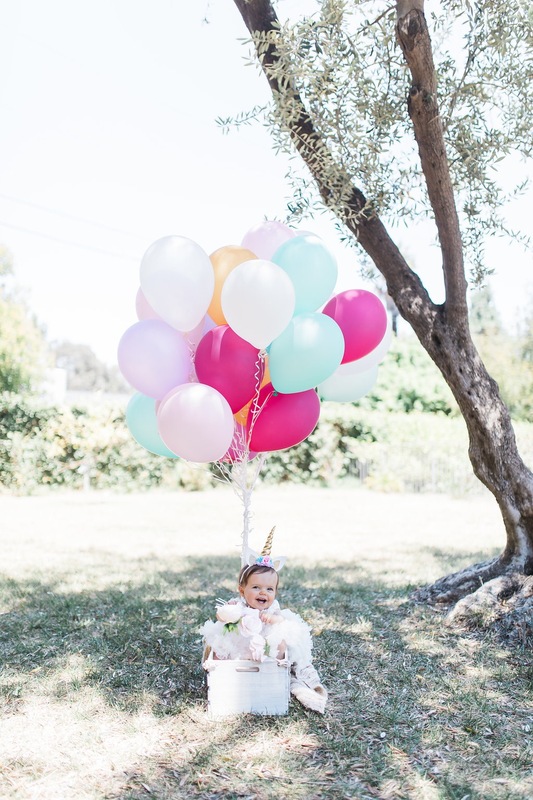 my girl is turning one in november and already ordered so much unicorn stuff on etsy for her theme.. the link for the party hats isn’t working for me, what shop was it that you bought those for the kids? love them ! happy birthday molly !! Ali! This is so cute! I love the theme, decorations, and the food looks so good! Happy birthday to Molly!! And congratulations mom and dad for making it through the first year!! How did you decide on a theme? So cute! I will be celebrating my son’s 1st bday party this weekend! Can’t wait! Everything is so cute!! It’s so crazy because my Zoe and Molly look very similar! 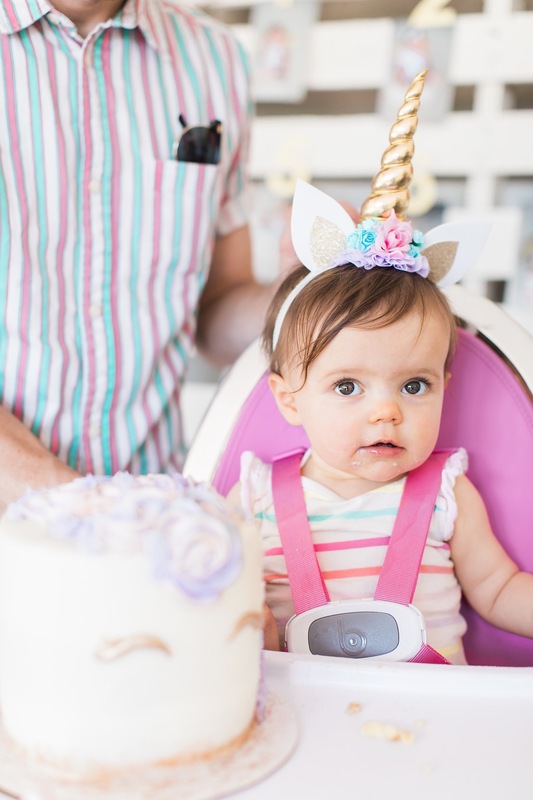 And we were also planning to do a unicorn birthday party for her first birthday in December too! She was born with a hand difference that is so rare (1 in 30,000!) so we call her our little unicorn! Love everything about Molly’s party!! 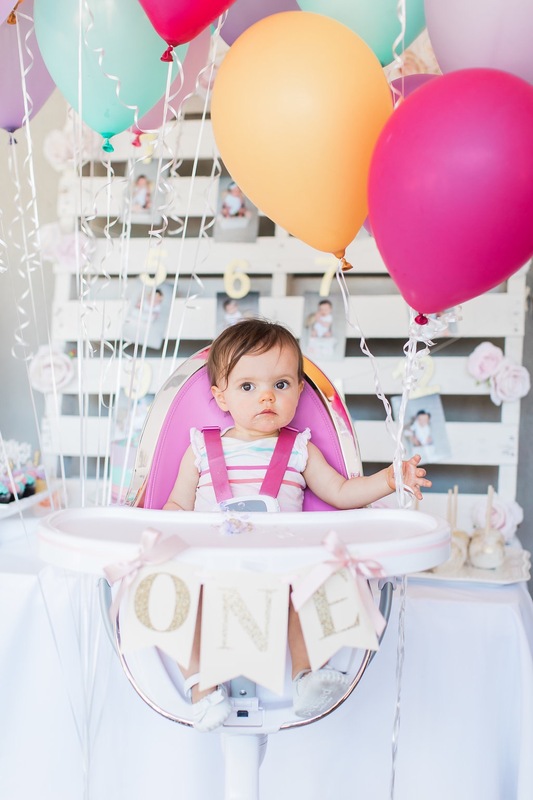 Thank you for sharing your Molly’s 1st birthday party it looks like the best day! That very last photo of Molly with the balloons is beyond gorgeous!! Cutest birthday party ever!! The decorations were detailed without being over the top! Etsy is the best!!! I loved all of the subtle colors in the signs. The pictures of Molly are adorable. I hope she has a great birthday! You guys are such a beautiful family. Thanks so much for sharing such a special day! My daughter is turning one in August so your post was really helpful! What size shoes did you end up getting? Happy Birthday Molly!!!! You are such an adorable little girl. Ali, I’m a huge fan of yours. I watched you on the bachelor /bachelorette. I absolutely love your style. Huge fan, I’m so glad you have this website to connect with your fashion styles. The birthday party decorations are so cute. If I could get a shout out from you that would be totally awesome. Happy happy 1st birthday sweet Molly! 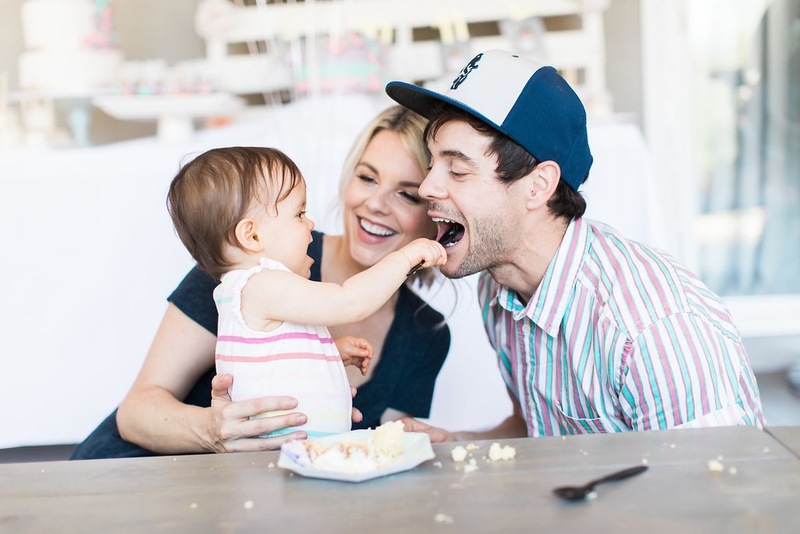 Ali, you and Kevin are the epitome of perfect parents. You can see how happy and content Molly is. 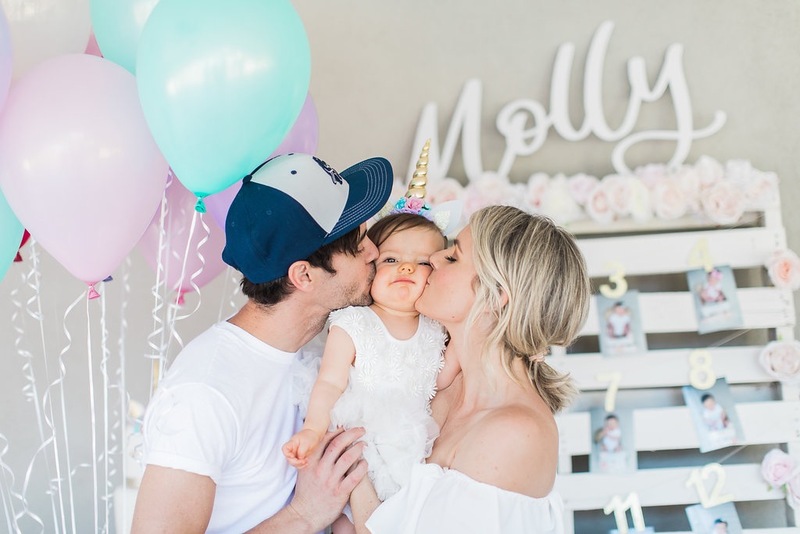 I completely loved looking at all the pictures and reading about all the special details of Molly’s party! I have two granddaughters, both under the age of two, and I can only hope to help my daughter make their future birthdays as beautiful as you made Molly’s! 🦄💖 God bless your little family. This is so so sweet and adorable! I LOVE the low tables idea….do you know where they found those? Absolutely adorable!! 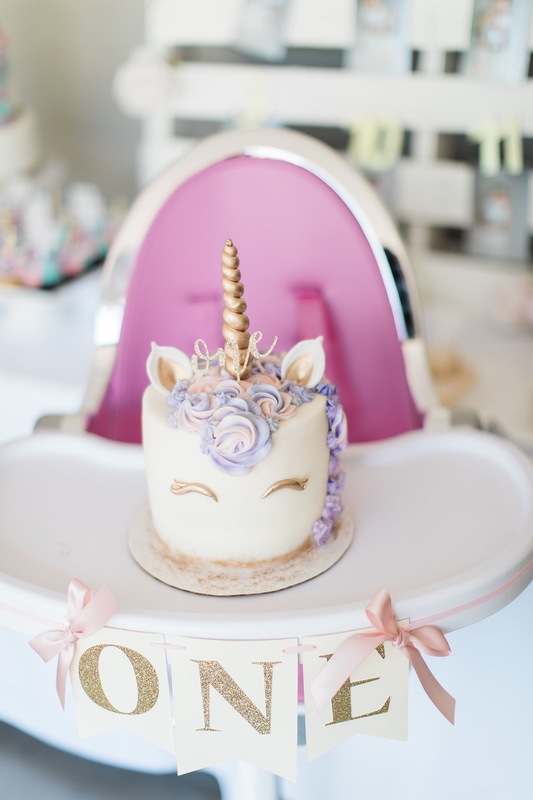 We are doing a unicorn theme for my daughter’s first birthday next month and just love all you did! A few of the Etsy links aren’t working… the numbers for the pallet and the unicorn hats and bags… would you mind linking those? I can’t get the unicorn bag and hat link to work. Can you give that link again? I love them! “Supreme elegance merges with supreme simplicity. “. We feel that it was maternal love that worked everything. It is charming and touching at the same time. Molly understood these feelings with her intuition and she reflects this very well. Congratulations for this beautiful angel and thank’s for sharing these photos. We had my sons birthday party last weekend too! Instead of gifts for him we had everyone being new items to donate to the local children’s hospital 🙂 also just saw your story about weaning from breastfeeding, I stopped pumping a few weeks ago and had my Last feed last week! Mixed emotions. It mostly excitement for me! Lol. Good luck with it! Great job keeping it up for the year! It’s hard work! Aw! Happy birthday Molly! We’re on the countdown for my daughters first birthday… I just saw your insta story about weaning her from breastfeeding! Yay congrats for making it a year. Such dedication and hard for us moms! I was just wondering how you’re weaning her? I don’t plan on weaning my daughter but the cross over to milk of course is coming up. What have you guys decided to do?! There’s so many options!!! Happy birthday Molly!! Yours was the 1st season of The Bachelor franchise I ever watched, and I’ve loved following your updates ever since! Hoping you do a blog post about weaning Molly soon! 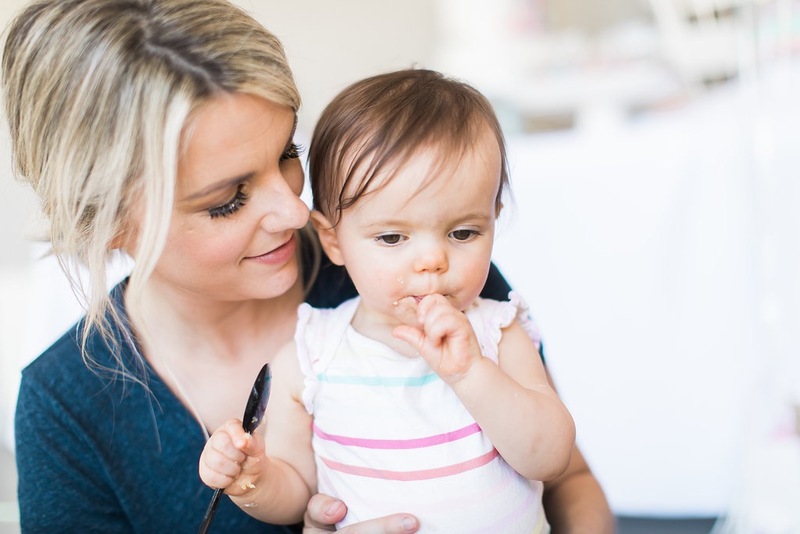 My son will be 1 next month and I’m planning on starting the weaning process soon after that and would love to hear how you’re doing it. Best of luck with your beautiful TODDLER! Reading about Molly’s birthday made me feel like I was there. Lol ☺️ Happy Birthday to your cutie pie. I’m getting choked up my daughters 1st birthday is on Tuesday. And I can’t come to think on how I’ll be when I wake up that morning. If I’m gonna be smiling from ear to ear. Or if I’m gonna finish a box of tissues. But on another note great job on the decor it looks fabulous Allyson’s birthday theme is Under the Sea. I absolutely love everything about this party and Molly looked adorable!! I’m planning my daughters first birthday in August and I am also doing a unicorn theme. I’m having troubles opening the unicorn hat link and the ONE banner. Any suggestions? such gorgeous setup, so inspired! Happy Birthday to Molly! What a cute theme. I have enjoyed reading about your first year with Molly and she is a lucky little girl. I will continue to enjoy reading about her adventures as a toddler. My baby turned one on the 1st. It was very emotional for me as well but I had to remember that the best is yet to come. Thank you for sharing with us! 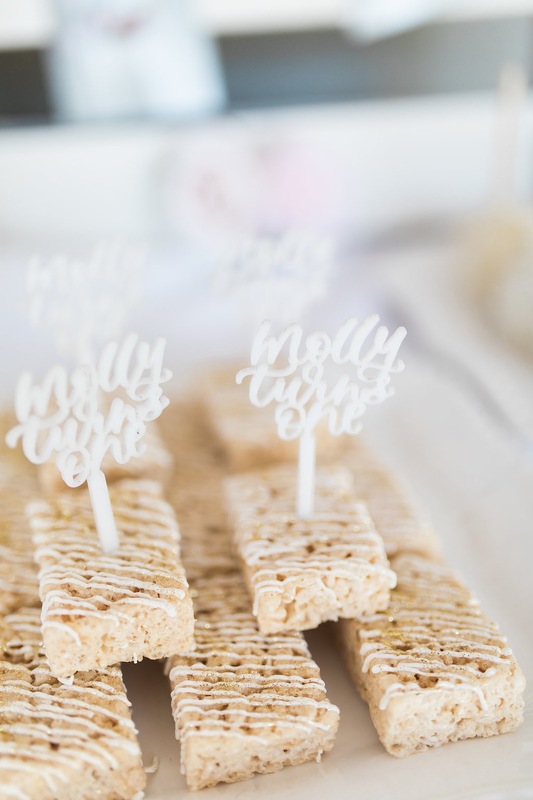 1) Did you have the rice crispy treats made or DIY? 2) Are those ice cream sippy cups? AMAZING. Could you advise where you found them? What an amayzing birthday party for Molly she looks very happy, all the food looks so amayzing congrats to both of you for being such a good parents for her. Happy Birthday Molly! You make a beautiful unicorn!!! Ali! Our girls were born on the same day and we are having Madison’s first birthday party tomorrow. Our theme is one in a melon. Your party turned out so cute! Congrats on Molly turning one! Where did you get the unicorn rocking chair? 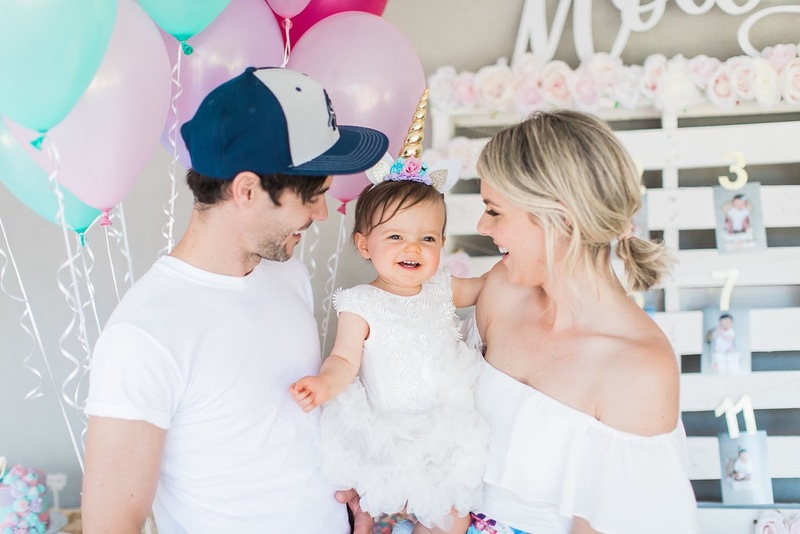 Ali– amazing birthday party for Molly! She’s so adorable! I’m also wondering where you got the unicorn rocking chair? Thank you! The party and theme was so cute! Thanks so much for featuring the ONE flower letters! Adorable Ali! Molly is one lucky little! Her first Birthday came way too fast, right? Beautiful party!! I can’t get the links to work for the ONE highchair banner. Could you tell me what the shop name is on Etsy? Thank you so much for sharing these stunning photos of such a special day! I LOVE seeing Molly in such a pretty dress! Has anyone approached you to model Molly? She is absolutely beautiful! This is precious and I love your beautiful taste in party planning! 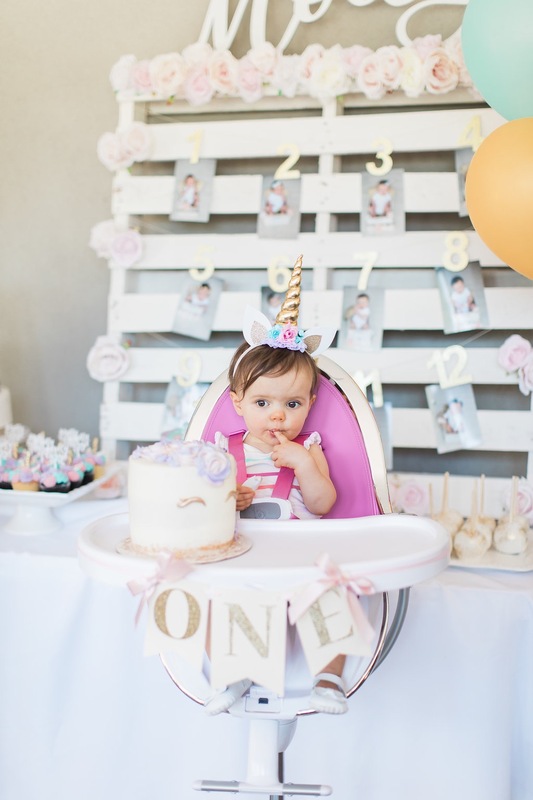 I am very interested in getting many of the unicorn items you bought off easy but most of your links don’t work (the unicorn party hats, the ONE banner for the high chair, the 1-12 hanging numbers for the photos, etc). How can I find those? Would LOVE for you to make the links work (maybe they sold out and took down their sites?). Thanks so much in advance! Have you found the links by chance? I’ve followed you for years! Since The Bachelor, to be honest. I saw your IG story yesterday asking about TV time for toddlers. I wasn’t sure how to connect with you, so I’m posting my thoughts here. We have a 3 year old and a 6 month old. I will say our first born didn’t seem interested in much on TV until about 18 months old. Then we noticed her LOVE for Mickey Mouse Club House! LOL. I know there are many opinions out there about TV time for babies/toddlers and every parent has to do what makes sense for them. I’ll just tell you that I find it unrealistic to say “no TV until a certain age” – ESPECIALLY with two kids. I believe in balance in everything. We have limits and certain times of day where the TV is on for our kids – the 3 year old girl is very into certain shows and likes to have the iPad while we are on the road. Our 6 month old is all over the place in his exercauser or walker most of the time, but I’ve noticed some shows will catch his eye. Every parent needs a few moments at times to grab coffee, change clothes, pack the diaper bag – or whatever – and the TV does grab their attention. I completely understand where you are coming from and I think the few moments of peace you’ll find will outweigh any “developmental” concerns. Do what’s best for you, but be realistic. What will you do when Molly is 3 and in LOVE with Sophia the First and you have a new little one? It just won’t be so realistic for the TV to be off. Anyways, beautiful party for Molly! We pulled out all the stops for Stella’s first birthday and I’m already contemplating ideas for Eli’s — so much fun. Have you found the links by chance? Or found similar numbers? I’m in love with the unicorn theme! So freaking cute! I’m planning my daughter’s first birthday as well, Ugh time needs to slowww down.. holding back tears, haha. I was wondering if you could link where you got the ONE sign for her highchair? Have you found the links by chance? Or similar numbers? Hey Ali! 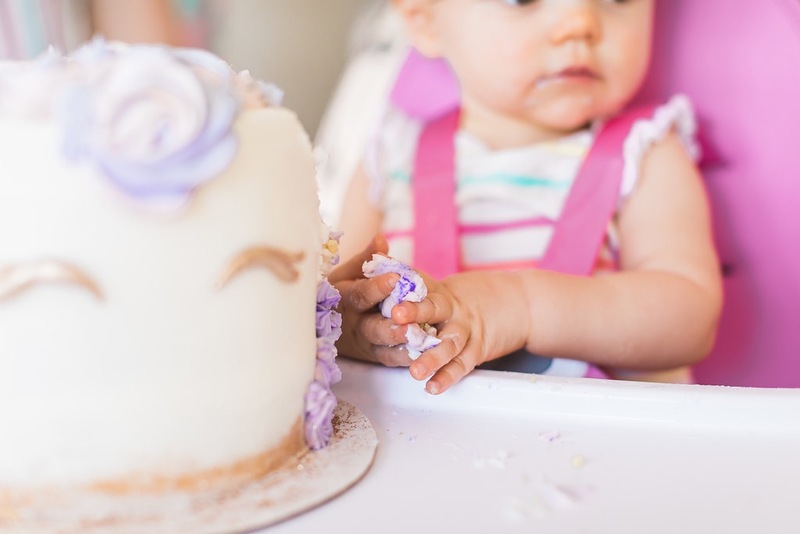 I was looking at your blog post for Molly’s first birthday party (SO CUTE!) and I was wondering where you got the numbers that you put on your diy pallet? The link you provided isn’t working. Thank you! Hi! The URL for the hanging numbers you used for her 1-12 month photos is not working. Would you mind sharing shop with me? Thank you! Have you found the link by chance? Or similar numbers? It comes with the numbers, the strange and the pins behind the number to attach the picture. And then you can trim it however you want them places. Hope this helps! Hi Ali! What a beautiful birthday party!!! Where did you buy the 1 through 12 hanging numbers from? Do you wish to make your daughters or moms birthday a memorable one, do you wish to make your mom pround of you on her birthday worry no more as you got the best birthday planners here call us to make your birthday a good and memorable okay email us on I (Amandapeters800@gmail.com) for more details. Thank you all as you apply. Hi Ali- I love everything! I’m trying to find 1-12 numbers but etsy is saying the link is incorrect. I’m having my daughters party and would love these as I’m doing the pallet as well. Would you mind looking up the link and commenting with a correct one? It would be hugely appreciated! I love all of these pictures. I can’t believe how well you caught the magical bright and clear feeling of a unicorn for this party. I think my favorite thing you did was re-purposing the pallet as a photo display. How did you make the flowers that you decorated with? Here is a blog of mine for 1-year-old girls. This is super adorable! I love the colors, designs, everything. You really had an awesome party I guess. I’m planning my daughter’s 1st birthday and I saw your post. It’s really incredible and gave me an inspiration on what I should do. You’ve got a pretty family. More blessings and post from you.